I've been to plenty of Pilsner Urquell Original Restaurants around Prague. Some, like U Vejvodů, have more of a unique style. But others, like Kolkovna, Celnice, Olympia, and Deminka, and the new Malostranská beseda appear to have been stamped out by the same franchise-sized cookie cutter. 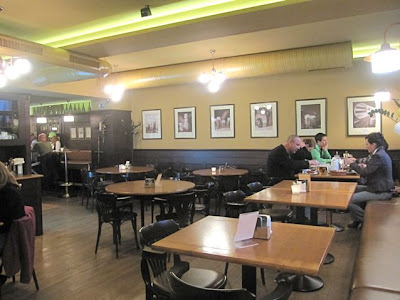 So when friends told me another Pilsner pub called Kulaťák had opened at Vítězné náměstí, I wondered if it was worth the trip. One said he liked it, and the other told me it was always crowded and almost impossible to walk in without a reservation. So I had to go see for myself if it was anything special. My first visit was a solo effort. The layout may have been different, but the interior had that very familiar PUOR look. 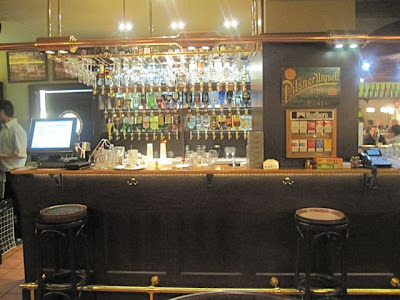 There was lots of copper, including a copper hood over the bar, dark wood, uncomfortable chairs, and a green theme. It took a long time before a waiter came over, acknowledged my existence, and delivered a menu. There was another long wait before he came back to take my order. I was driving, so I couldn't sample the Pilsner on this visit. Instead, I ordered sparkling water. 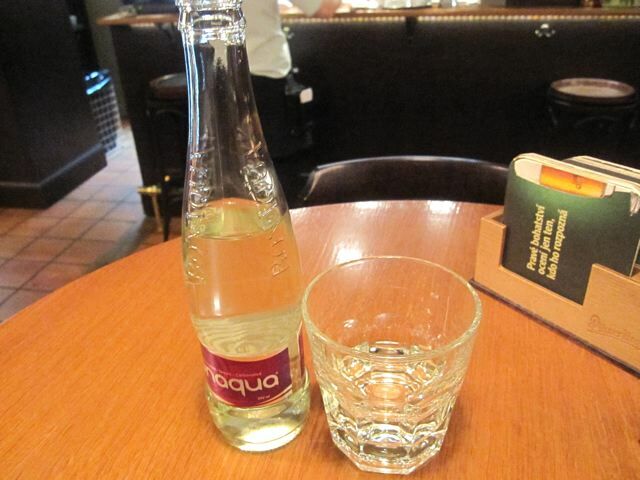 I was unhappy they serve Bonaqua, which is filtered tap water in tiny .25 liter bottles for a large price (39 CZK). I much prefer Mattoni in .33 liter bottles. For my meal that evening, I ordered the 150 gram, chef-seasoned beef tartare (229 CZK). They also have a 300 gram version (450 CZK). They also serve it unseasoned with the condiments on the side, and you can do it yourself. It took 25 minutes from the time I arrived until I received my meal. Those minutes go by slowly when you are by yourself and hungry. 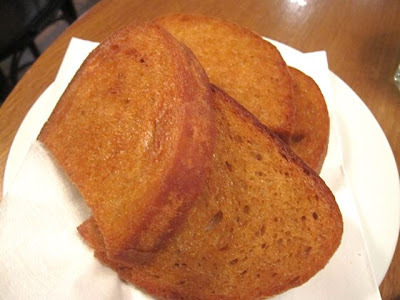 The meat came with four "topinky" -- Czech bread fried in oil with raw garlic cloves served on the side for rubbing on it. It came out hot and crunchy. 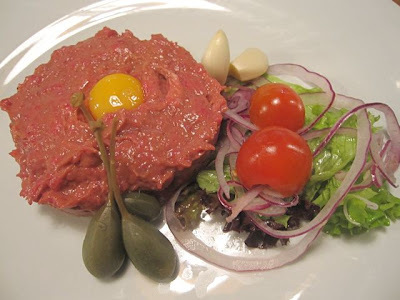 The flavor of the raw beef was pretty good. It was correctly salted, and the taste of mustard dominated. I also detected some ketchup, finely chopped onion, and perhaps a hint of Tabasco. A quail egg sat on top. If I was going by flavor alone, I'd like it. But what really turned me off was the texture. Perhaps some like it this way, but the meat was puréed into a near liquid state that I really don't appreciate. I prefer some semblance of meatiness to my raw meat. The check for this simple meal was 268 CZK. I came back a week later with Jersey Girl. This time, we got a table in the no smoking area. 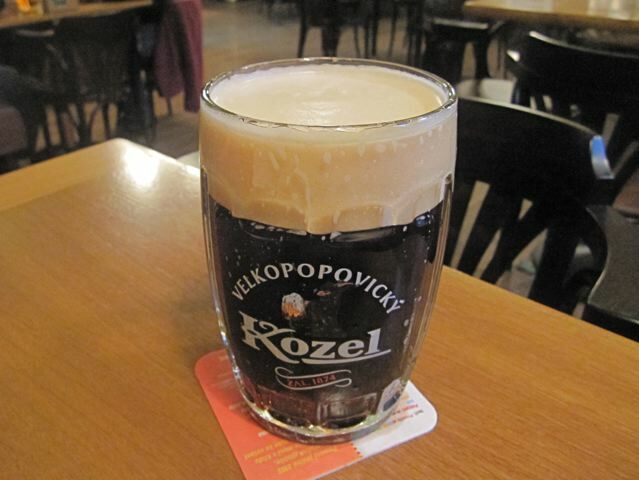 She ordered a .5 liter glass of Kozel's dark beer (39 CZK). She said it was not cold enough for her taste, but otherwise OK. 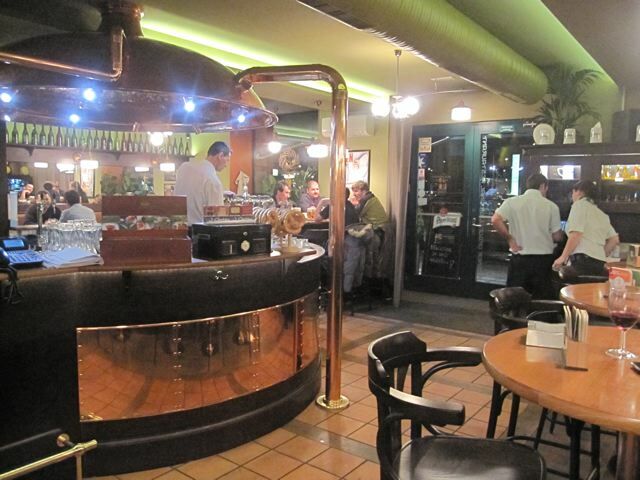 The Pilsner Urquell (39 CZK), which is unpasteurized and served from tanks, was as good as you'd expect. 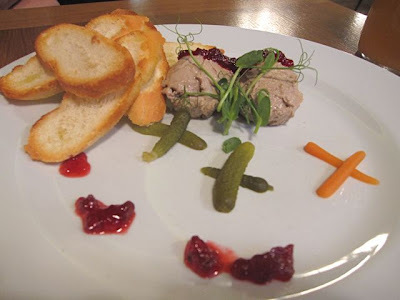 We shared a starter of homemade pâté (149 CZK). This meat was also whipped into a fine cream. But in this case, the flavor and texture worked better. It comes with slices of toasted baguette. Perhaps because the pâté didn't taste strongly of liver, Jersey Girl enjoyed it as much as me. That's quite something because she is generally a fish-eating vegetarian, but she's not strict about it and has few qualms about tasting meat now and again. 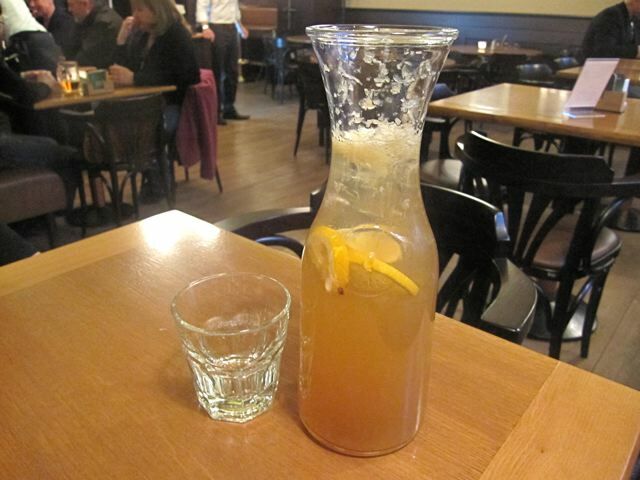 I saw on the menu that they had homemade lemonade served in a .7 liter carafe, so I ordered that (60 CZK). It was not as good as I'd hoped. The flavor was rather watery. It only had a light amount of sugar, which was good, but the flavor of the lemon was rather weak as well. Also, it had an odd, brownish color, which led me to think it had been sitting around for a long time. For her main course, Jersey Girl ordered the Norwegian salmon steak marinated in lemon juice with potato, sautéed vegetables and herb butter (199 CZK). She described it as very well-prepared. The fish was fresh, juicy, and light. 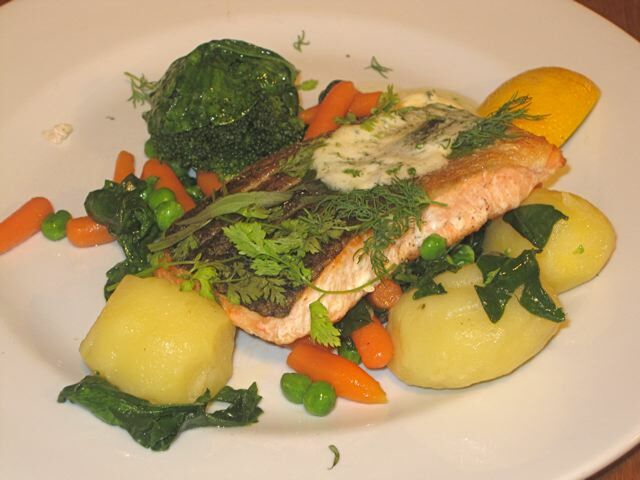 I'm not a big cooked salmon fan, but thought it was quite tasty. The vegetables were very plain peas, carrots, and potatoes. For my main course, I was torn between the koleno -- pork knee/knuckle, the Moravský vrabec -- pork pieces with sauerkraut and dumplings, or grilovaná krkovice -- grilled pork shoulder/neck. The first two options were tempting, but I just wasn't in the mood for that much food. So I got the 200 gram krkovice (179 CZK). There are also 300 gram and 400 gram versions. Mine came covered with whole peppercorns, and potatoes au gratin. I don't know if this dish was representative of the rest of their Czech dishes, but it was just plain bad. The thin cut of pork was way overcooked. It was tough, dried out, and had an odd, overseasoned flavor. What that seasoning was, I could not say. I've had some great krkovice recently -- the one at Neklid comes to mind. Kulaťák's didn't even come close in quality or preparation. The potatoes were bland and unremarkable. And the sauces on the side also bored me. 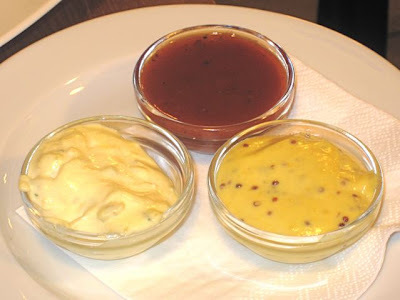 There was a tartar sauce, an oddly seasoned ketchup, and a creamy mustard sauce which was the best of the three, but that's not saying much. 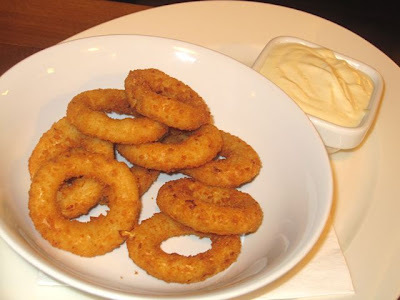 To go with my meal, I got the fried onion rings (99 CZK). These were very much in the Burger King style, which is not necessarily a bad thing, in my opinion. Perhaps they were not prepared in-house, and they didn't taste too oniony, but they were a step above BK's quality-wise. They came with a very mild blue cheese sauce that tasted more like mayo. After two visits, I wasn't very happy with Kulaťák. 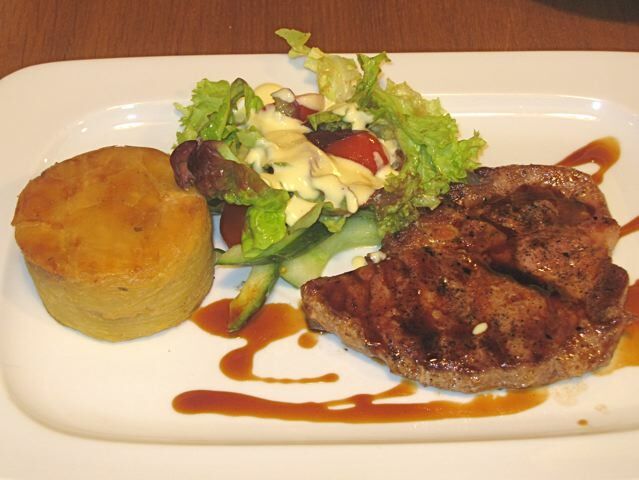 The service was generally poor, some food was OK, some was bad, but nothing I tried was above average. 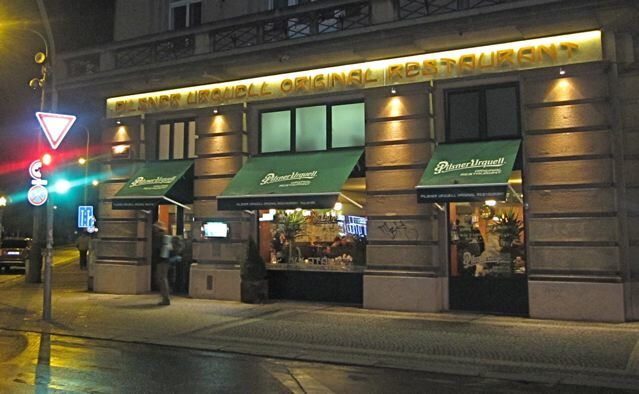 If you've had better dishes or think this place does something better than the other Pilsner Urquell Original Restaurants, feel free to let me know. For me, even though Kulaťák is pretty new and appears to be a welcome addition near Dejvicka, it was really just more of the same.